Although it had an English name, the Marlborough was a wholly French car to start with, being made by components suppliers Malicet et Blin for sale on the UK market. It first appeared at the 1906 Olympia Show as a 7hp single-cylinder light car, exhibited by the Chassis Construction Co. of Taunton who also made their own C.C.C. cars. In 1909 T.B. Andre, best known for their shock absorbers took over the agency and began to sell conventional medium-sized cars powered by pair-cast 4-cylinder engines, 3-speed gearboxes and shaft drive. In 1915 the engine was enlarged to 1207cc and artillery wheels replaced wire, giving the car a more solid appearance. The first postwar Marlboroughs were mainly French, still with round radiators, but for 1921 there was a flat-radiatored 10/20hp with 1496cc British Anzani engine. 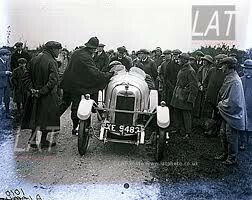 The 1922 Roadspeed model was guaranteed to reach 60mph (97km/h), but for 1923 it had given way to a smaller car with 1100cc C.I.M.E ohv engine and no differential. This was listed up to 1926, joined by a sports car with 1991cc ohv 6-cylinder Coventry-Climax engine and 4-wheel brakes, but never went into production.